The toponymy information comes from the Commission de toponymie du Québec as well as other sources. Additional information, if any, comes from other sources. You will also find, in connection with certain places, the genealogy of a Labrecque or a Labrèque. This icon Indicates that a note, including its origin or meaning, follows its technical description. Origin and meaning: This name evokes the memory of Alphonse Labrecque, general contractor, who was the first occupant of this road in 1963. He is part of a well-known family through the company "Les œufs Labrecque". The street was baptized in honor of J. Alphonse Labrecque who deforested and built a first cottage along this small land road before 1963. He cleared and built many houses, businesses and buildings in Trois-Rivières and in Cap from about 1920 to 1965. He has been associated with several municipal committees and accomplishments as a member of the municipal hearing office of Trois-Rivières in connection with the construction. He was a member of the joint committee on the observation and validation of carpenter competence licenses. He was the first contractor to install the first mobile staircase at major restorations in the former Mozart General Store. He was a specialist in the renovation of old houses. Other sources: Bulletin des Labrecque, vol. 8, no 3, p, 18. : Letter of Yvon Labrecque (no. 356), of 4 June 2003, in order to safeguard the avenue Alphonse-Labrecque. This letter is addressed to Mr. Michel Veilleux, Councilor of the District of Pointe-du-Lac, Ville de Trois-Rivières. Origin and meaning: The origin of this name and, if any, its meaning could not be determined until now. Other name: Barrage du moulin Labrecque (dam X0003708 of the Center d'expertise hydrique). The structure made of logs and rocks was built to supply the mill of Armand Labrecque. The dam became unusable after the opening of a breach during Hurricane Irene on August 28, 2011. The riparian owners plan to replace it with a new structure. This low capacity structure allowed recreational and resort use. The height of the dam is 3.5 m and its length is 22 m. The reservoir had a holding capacity of 15,200 m³, with a holding height of 3.1 m. The reservoir area was 0.5 ha and the catchment area was 29.3 km². The building was built at the beginning of the 1860s. It was built on the banks of the rivière aux Billots (Billots River) on lots 924 and 926 of the Grande route des Montagnes (Great Highway of the Mountains), today rue de l'École, it was prior to the founding of Saint- Damien. The right of initial casting was granted by Jean-Thomas Taschereau, lord of the increase of Saint-Michel. During his many years of service, the mill will have been run by Jules Fradet, Narcisse Drapeau of Frampton, Joseph Brochu son, Joseph Brochu father, both of Saint-Lazare, Joseph Therrien also of Saint-Lazare, Noël Laflamme, Narcisse Drapeau, then Napoleon Drapeau by way of inheritance, Ferdinand Laflamme, Joseph Bouffard, who was miller in Saint Charles, and finally, Armand Labrecque, a native of Saint-Nérée, and his son Ghislain, who were the last exploiters. In 1914, a new stone mold of 6 feet in diameter was installed. The carding machines, located on the third floor, were transferred to the shed at the time of Armand Labrecque. In 1996 and 1997, the Société historique de Bellechasse carried out two renovation projects with the volunteers of the Mouvement québécois des Chantiers jeunesse. n the first year, the unsafe wood water channel was demolished and reconstructed masonry walls forming the wheel cage. The mill was also "lifted". In the second year, the roof of the sawmill was repaired and the site was cleaned. In the flour mill, very small, the miller had to be extremely skilled in traveling between movements from one machine to another. The operations of the mill were revived on a small scale for the centenary of Saint-Damien in 1982, before being interrupted some fifteen years later. Le toit de bardeau de cèdre a été remplacé par un toit en tôle vers 1970. The large water wheel and grinding mechanism remain intact at the rear of the building. Cedar shingle production equipment is also in place. The one used to card was sold. Two small dwellings occupy the former quarters of the miller. Reading Suggestion: Bulletin des Labrecque, vol. 3, no 2, p, 8: « À Saint-Damien, rénovation du moulin Labrecque ». The origin of this name and, if any, its meaning could not be determined until now. Origin and meaning: This name recalls the memory of Cyprien Labrecque (1839-1915), first mayor of the municipality of Cloridorme, from 1885 to 1892. Origin and meaning: This path is located in an area where the lines of communication are identified by the names of artists and other cultural figures. We recall here the memory of Jacques Labrecque (1917-1995), who was a singer, folklorist, storyteller, producer and publisher of Québec. In 1949 he represented Canada at a folk festival in Venice and subsequently devoted himself to the interpretation and diffusion of folk song. In 1975, he retired to Charlevoix and organized tale vigils. He enjoyed successes in particular with "La parenté", "Monsieur Guindon" and "Jos Monferrand". To know more, see the page in "Exceptional Labrecque" on Jacques Labrecque. Origin and meaning: This odonym evokes the memory of Jacques Labrecque (1917-1995), an interpreter, folklorist, producer, actor and publisher, who lived in Baie-Saint-Paul for thirty years. During this period, he produced two discs on the Saguenay-Lac-Saint-Jean (1982) and Charlevoix (1983) regions in the collection "Géographie sonore du Québec". He began his career in the late 1930s at the « Variétés Lyriques ».Thanks to an American patron, he went to London, England, where he recorded his first records (1949). Jacques Labrecque lives in Europe from 1951 to 1956. He enjoyed successes in particular with "La parenté", "Monsieur Guindon" and "Jos Monferrand". 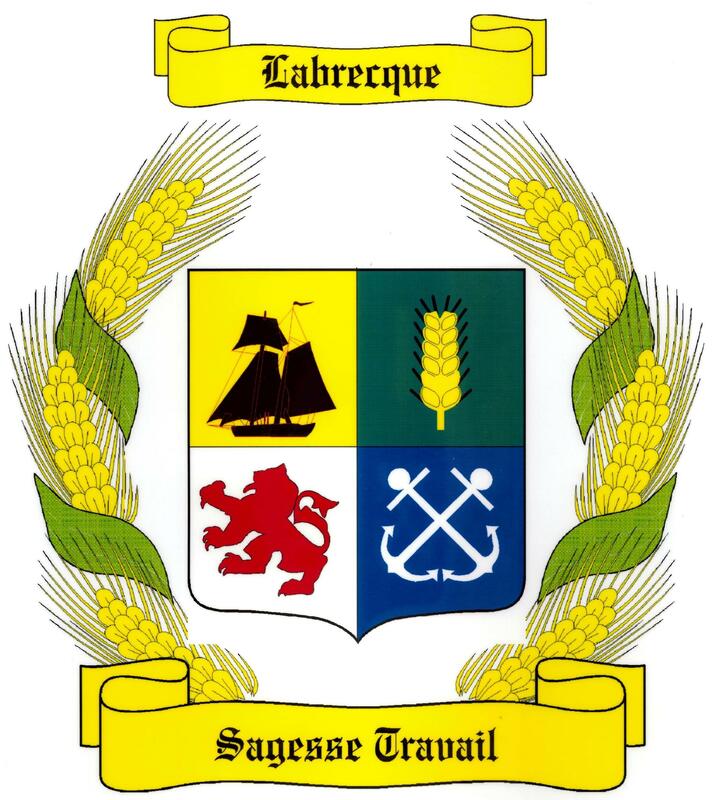 Origin and meaning: This name evokes the memory of Jacques Labrecque (1917-1995), a native of Saint-Benoît in Mirabel, who was a folklorist singer, producer and publisher in Québec. Origin and meaning : The name of this communication route is reminiscent of Jean-Paul Labrecque (1927-1988), general contractor. The latter has owned the land where this street is located. Mr. Jean-Paul Labrecque was a construction contractor who managed to establish himself as general contractor in Amos and also at Lebel-sur-Quévillon. In Amos, the elected officials entrusted him with the construction of the curling site in 1967. From 1974, he owned for twenty years the land where is located this new street. In addition, he was the initial promoter of Plante and des Hirondelles Streets located in the same area and was at the origin of the path that now corresponds to that of the street. 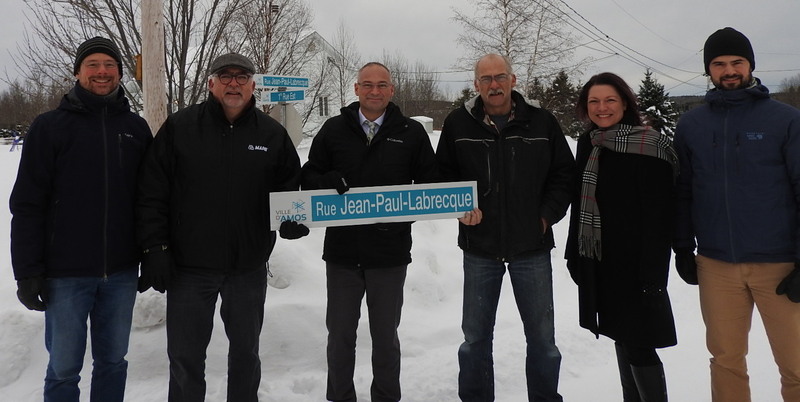 On January 7, 2019, the Labrecque family (Marc and Réjean, Jean-Paul's two sons) were able to attend the unveiling of the display of this new street located in the area of the 1re Rue Est and Plante Street. Réjean Labrecque, son of Jean-Paul; Nathalie Michaud, municipal councilor; Étienne Lefebvre-Guimont, town planner. Source: Press release of January 10, 2019 - Ville d'Amos. Origin and meaning: In honor of Joseph Labrecque (1885-1960), born in Saint-Gervais de Bellechasse. Son of François Labrecque and Mathilda Lemieux, he studied at Saint-Gervais and at the École normale Laval in Québec. In 1908, he married Laura Turgeon, of whom were born three sons. After teaching in Saint-Gervais and Québec for nearly 8 years, he settled in Sherbrooke in 1911. Originally committed to the furniture merchants Edwards, he launched a clothing and men's business located on rue Galt (Galt Street). For nearly ten years, he was an appraiser for the Ville de Sherbrooke (city of Sherbrooke). In 1924, he became city councilor for the western district until 1930. In 1940, he was elected mayor of Sherbrooke for two consecutive years. During his tenure, the City carried out major works, including water, sewer and gas services. He was later commissioned by the Commission scolaire catholique de Sherbrooke from 1937 to 1946, then president until 1948. Finally, J. Labrecque is the President of the Board of Directors of the Hôtel-Dieu, the churchwarden of the parishes of the Immaculée-Conception and of Saint-Joseph, and the president of the annual campaign of charity and campaign of the Red Cross. His son took over from the clothing store on his death. Additional information : Labrecque bay on Welk Lake near Lac LaRonge in northern Saskatchewan honors the memory of Hervé Labrecque. Hervé Alfred Labrecque was born on May 23, 1921 in Rosetown, Saskatchewan. He is the son of Telesphore Labrecque and Rosilda Brulotte. During World War II, Hervé served with the Royal Winnipeg Riffles (RWF), an regiment of the Canadian Armed Forces Reserve. The Canadian Regiment landed on Juno Beach and drove inland toward Caen on June 7, 1944. The Germans captured the RWF soldiers as prisonners. At the Château d’Audrieu, Private Hervé Alfred and twelve others prisonners were executed on June 8, 1944. Reading Suggestion: Bulletin des Labrecque, vol. 13, no 3, p, 11 : « Hervé Alfred Labrecque, a World War II Hero (1921-1944) » by Lucille Labrecque Nawrocki. Origin and meaning: he land surveyor Jean Maltais, in his report on the township of Labrecque, in 1895, mentions "Lac aux Brochets" to identify this body of water. Origin and meaning: A land of lakes and rivers, between Bégin and L'Ascension-de-Notre-Seigneur, north-east of Alma, the Lac-Saint-Jean region received its first settlers in 1917. It was shortly after the proclamation of the township of Labrecque in 1920 that the homonymous municipality (1925) was erected, whose name underlines the veneration of the pioneers towards Monseigneur Michel-Thomas Labrecque (1849-1932) sacred third bishop of Chicoutimi from 1892 to 1928. This name also marks the presence of lac Labrecque, called "Lac aux Brochets" in the survey report of 1895, nearby. Saint-Léon-de-Chicoutimi, a name that identifies the post office in 1927 and also attributed to the canonically erected parish in 1956, and Saint-Léon-de-Labrecque for the same period Léon Maurice was born in 1889 in Saint-Jean-Baptiste-d'Elbeuf, diocese of Rouen, and died in Chicoutimi in 1973. He was the first resident priest of the parish. He acceded to the post of prothonotary apostolic in 1926. To know more, see the page in "Exceptional Labrecque" on Mgr Michel-Thomas Labrecque. Origin and meaning: Ce nom évoque la mémoire de Michel-Thomas Labrecque, 3e évêque du diocèse de Chicoutimi. Origin and meaning: This bridge is built above the rivière Creuse, on the course of the rang Saint-Antoine Ouest (rank Saint-Antoine West). Its denomination refers to a local surname. Origin and meaning: This route runs from the Saint-Nazaire municipality to the limit of 9e Rang Ouest (9th Rang West) and 9e Rang Est (9th Rang East) in the municipality of Labrecque. Its name evokes the memory of Monsignor Michel-Thomas Labrecque (Saint-Anselme, 1849 - Chicoutimi, 1932); He was bishop of the diocese of Chicoutimi between 1892 and 1928. Origin and meaning: This route links the municipality of Labrecque to the main street of the municipality of Saint-Nazaire. Its name evokes the memory of Monsignor Michel-Thomas Labrecque (Saint-Anselme, 1849 - Chicoutimi, 1932); He was bishop of the diocese of Chicoutimi between 1892 and 1928. Origin and meaning: This street is identified by the name of a local family, as is the case for several communication channels of the municipality. Origin and meaning: This denomination is made up of a surname. Origin and meaning: This name reminds Henri Labrecque, contracto, owner of buildings along this road. Date of designation: June 18, 1908. Origin and meaning: This street is located in an area where the lines of communication are identified by surnames. Origin and meaning: This name evokes the memory of Augustin Labrecque (1849-? ); He was mayor of the municipality of the parish of Saint-Anselme, from 1878 to 1881.
he name also evokes the memory of two ecclesiastics born in Saint-Anselme. The first is Michel-Thomas Labrecque (1849-? ), Who was bishop of the diocese of Chicoutimi, from 1892 to 1927; The second was François-Albert Labrecque (1865-?) who was ordained a priest in 1896 and appointed parish priest of Notre-Dame-de-Laterrière. Origin and meaning: This denomination is part of a thematic issue relating to surnames. Origin and meaning: This route, located in the borough of Rock Forest-Saint-Élie-Deauville in Sherbrooke, recalls the memory of Albert Labrecque (1913-2006), a salesman of automobiles. It was opened in 1995 as an access road to rue Leclerc (now Rue Jean-Marc-Leclerc), on land that belonged to Albert Labrecque. Origin and meaning: Louis N. Labrecque was councilor of the Ville de Cap-de-la-Madeleine, from 1923 to 1929. Origin and meaning: This designation is part of a sectoral theme based on family names. Origin and meaning: This street is identified by a local surname, as is the case for a large number of communication channels of the municipality. Additional Information : To come up. Origin and meaning : The origin of this name and, if any, its meaning could not be determined until now. Origin and meaning : This name evokes the memory of Roger LaBrèque who was mayor of Acton Vale from 1948 to 1962 and from 1974 to 1986. Other sources: Genealogy: CD of genealogy - Les Labrecque tous réunis.